I’ve casually mentioned in several of my posts about the “must have” items to take along with you on your adventures to ensure survival. Not literally, but as a parent. You all know what I mean. I wanted to make sure no one makes the same mistakes we have by repeatedly forgetting these critical things so I compiled them all here. A bucket- Obviously. I can’t tell you how many times we have been out exploring and my little cherubs begin collecting treasures and insisting that Mommy carry them. Under no circumstances am I to “accidentally” drop ANY of the 500 rocks, sticks or leaves that they have deemed priceless and don’t think they won’t check in with you periodically to make sure you still have them all. Every kid needs their own bucket to fill along the way. A water bottle- my kids are perpetually thirsty and will blow through a 20 ounce water bottle on one hike and then complain they are thirsty the rest of the time. Make sure you at least have one full cup per kid and a back up bottle of water for refills. A sun hat- nobody likes a burnt scalp and it’s important to protect tiny eyes from the sun. If you can get them to wear sunglasses, you get bonus points! Hand sanitizer- Also self explanatory. Sunblock- Don’t forget to apply to their ears and back of the neck, even in the cooler months. Wet wipes- We blow through wipes like no ones business with 3 kids. Whether it’s hands or faces (or butts! ), they are always filthy. Not to mention the perpetually runny noses in cooler weather, or during cold season, or in the Summer, or any time really. First aid kit- You never want to have band aids too far away. We’ve had our fair share of tumbles, in fact, we don’t usually get through any adventure without a boo-boo of some kind. Even if there are just tears, we all know a band aid can fix just about anything. SNACKS- LOTS of snacks. There’s never enough snacks. My boys are almost always famished. Also, when they’re getting tired and whiny, the promise of a snack when they make it a little farther can save your sanity. Nature journal- This is a great learning tool to guide your older child and combine reading, writing and drawing with nature. It’s a great way to remember each place you’ve been to. Scavenger hunts- Also a great motivational tool for when your kids would rather be attached to their devices than get out of the house. Turning your adventures in to a challenge or even a game can make them much more appealing. Kindness rocks- What better way to kill two birds with one stone (pun intended) than to spread kindness and get outside at the same time. We love getting creative at home and then (hopefully) making someone’s else’s day when they find our masterpieces. Magnifying glass- Best used for checking out the parts of a flower, or for looking at the tiny ecosystems under a log. Backpack/fanny pack- To carry all this crap in. Tick remover- This can stay at home but it will make your life so much easier when the inevitable happens. We’ve all heard the various ways people say to remove a tick…burn it with a match, smother it with oil to get it to back out, yank it with tweezers, but this handy dandy tool is really the very best way to get the little jerks out safely. Extra set of clothes- To be kept in the car. Let your kids get messy on your outings. Don’t worry about a little mud on their clothes, it will wash out. If you are prepared with a back up outfit, you can be more laid back and free to let your kids be kids. A towel- For wiping down wet playground equipment or wet kids. Can work as a changing pad or picnic blanket too! Emergency lollipop- You’ll thank me for this one someday. Always keep a lollipop stashed away for staving off meltdowns, as a distraction from big boo boos or if you need to keep your kid awake in the car on the way home so they don’t ruin their nap. Whatever you do, DO NOT let them accidentally see it until it’s needed. If age appropriate, also don’t forget a baby carrier and plenty of extra diapers. You do not want to be in the middle of the woods dealing with a blowout with no replacement diaper. Been there, done that! I recommend keeping your adventure kit in your car at all times, it comes in handy even when you’re not out exploring. 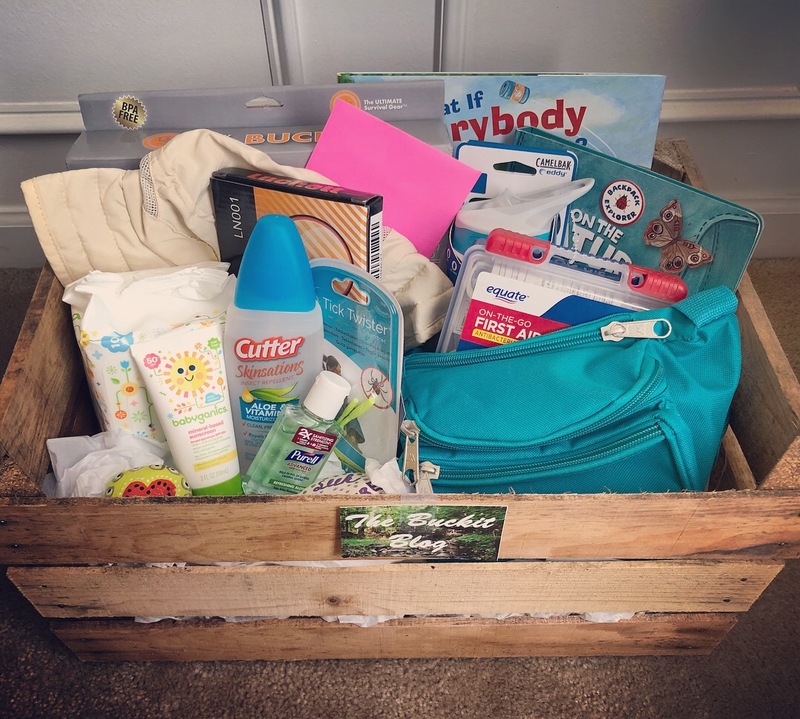 You can be the proud owner of this very adventure kit by attending the Gals That Give charity event benefitting the Breastfeeding Coalition of Delaware on October 18th, 2018. It is going to be a part of the silent auction, and is over $100 value!